The Confederate German and federal land? Reader Susan Graben thought she had things figured out about her husband’s 3rd great grandfather, a German immigrant named Louis Graben. From that and other records, Susan had thought, it seemed that Louis was naturalized in 1859. 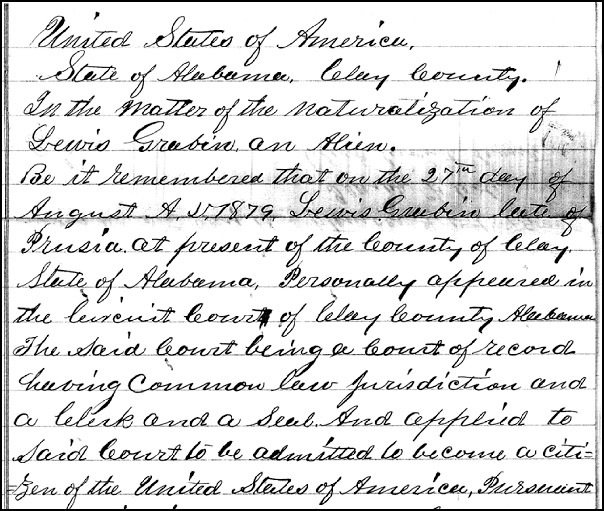 He was already living in Alabama by 1860, but the census showed two children — including a one-year-old — born in Georgia,2 so the naturalization might have been there. All in all, a nice neat story of immigrant success. So, Susan wondered… how did this German-born non-naturalized ex-Confederate get federal land in 1868? The answer, as usual, is in the law. And in particular in the Homestead Act of 1862 and its amendments. That underlined language is the key here: Louis had to have filed a declaration of intent to become a citizen, but he didn’t have to have completed the process at the time he entered his claim. 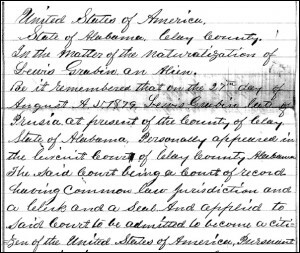 And, the law went on, a homestead claimant had to live on the land for five years and at the end of those five years “if at that time a citizen of the United States, shall be entitled to a patent.”12 And it was no accident that that time period exactly matched the time an immigrant had to be in the United States to be eligible for citizenship. But what about that other part of the statute — the one that says an applicant must be one “who has never borne arms against the United States Government or given aid and comfort to its enemies”?15 How does that get squared with Louis’ Confederate service? Note the time limit — that “I wasn’t a rebel” language only applied until 1 January 1867. And Louis didn’t apply for his homestead land until 1868. There should be a lot more information about Louis and this land in the actual homestead file at the National Archives in Washington, D.C. His application papers, proof papers, perhaps more leads to where he filed his declaration of intent to become a citizen and more should be part of that file. The shut down would not have happened if we were electing anyone next month. I wish I thought you were right, Toni. But I suspect this was going to happen no matter what. Could I clarify something: your phrase “wording was dropped from the act” rather implies the Homestead Act of 1862 was altered. Not so. It’s the Southern Homestead Act passed in 1866, one of several subsequent homestead acts passed after the original Act of 1862, that authorized homestead privileges to former Confederates. Plus, after Andrew Johnson became president, after Lincoln’s assasination, Johnson, being an unabashed southerner, granted amnesties right and left to former Confederates, so southern landowners were able to reclaim their lands which kept these fertile and desirable former Confederate tracts out of the homesteaders’ reach. But the Southern Homestead Act of 1866 (repealed about 10 years later) did effectively nullify the “if you bore arms or offered aid and comfort to the enemy (which excluded the wives of former Confederates from homestead, who would have given aid and comfort)” exclusion of southerners to homestead. Although the 1866 statute was the Southern Homestead Act which did other things, one of the things that law did WAS actually amend the original 1862 statute. That’s expressly what section 2 of the Southern Homestead Act says: “SEC. 2. And be it further enacted, That section second of the above-cited homestead law, entitled ‘An act to secure homesteads to actual settlers on the public domain,’ approved May twentieth, eighteen hundred and sixty-two, be so amended as to read as follows…” So yes, the 1866 statute was one of several subsequent homestead acts, but yes it is also true that the original Homestead Act of 1862 was altered, and it was altered by this statute. I gasped out loud when I read your footnote that the BLM website is down. Well, now this shutdown feels personal! I enjoyed reading about the “anti-rebel” language being dropped from the act – there are no Confederates in my family tree (yet) so I’d never thought about the implications of that wording.